Learning how to watercolor is a fun, low-cost option if you want to learn to paint! Watercolors offer a lot of possibilities for creative self-expression. On this site, you'll find tutorials about how to use watercolors, as well as detailed info about watercolor painting supplies. Introduction to Watercolors: To get started, learn about the characteristics of watercolor paint, so you can know what to expect when you start painting. Watercolor Painting Supplies: Learn about all the basic supplies you'll need to get started, from paints and brushes to palettes and paper! 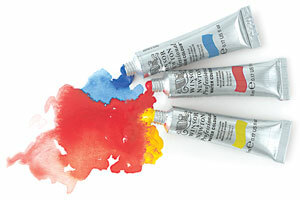 Plus, discover some extra watercolor painting supplies that may come in handy. Watercolor Paint: Here's a detailed look at watercolor paint that explains such attributes as color, permanence, quality, transparency, staining, brands and more, with suggestions on what to buy. Paintbrushes for Watercolors: Learn about the different types of paintbrushes available for use with watercolors, taking a close look at hair types, shapes and sizes, with suggestions on what to buy if you're a beginner. Watercolor Paper: Find out about different types of watercolor paper based on factors such as content, weight, texture, production, quality and more, with suggestions on what to buy. Watercolor Mediums and Additives: Check out these nifty mediums and additives that can be mixed with watercolors to change the paint quality. Accessories for Watercolor Painting: What else can come in handy when you're painting with watercolors? 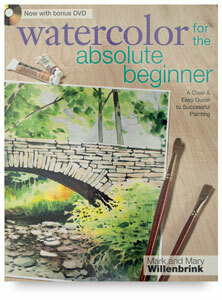 Find out here, with tips on watercolor palettes, masking fluid, sponges and more. Tutorial: Abstract Watercolor Painting: These watercolor painting instructions will show you step-by-step how to paint your own colorful abstract art, from start to finish. Easy lesson for beginners! Tutorial: Mixed Media with Watercolors: Learn how to use watercolors, watercolor pencils, and masking fluid to create a whimsical abstract painting. Frequently Asked Questions: Pick up some handy watercolor tips and techniques via this FAQ made up of questions from my readers. Watercolors are water-based and non-toxic, so paints are thinned with water and paintbrushes can be easily cleaned with soap and water. They are also non-smelly. Watercolor equipment is all very lightweight, allowing for easy transport. They also will not take up much room in your bag. 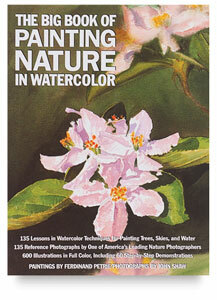 This is great for plein-air painting! 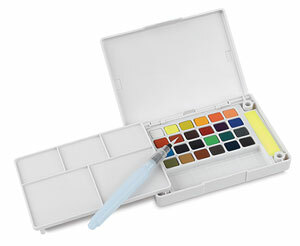 There are even dozens of all-in-one watercolor kits, specifically designed for plein-air painters or artists who travel frequently. 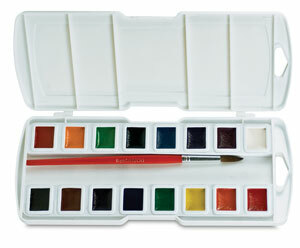 Because of the portability, ease of use and clean-up, watercolors are great for doing quick sketches or studies. This can be great for doing warm-up exercises or to get the creative juices flowing. Watercolors are also often used by still life, landscape or portrait painters to create small-scale studies of complex paintings that they plan to do in a much larger scale later. Watercolor works well with colored pencil, watercolor pencils, graphite and ink for creating mixed media pieces. Watercolors are traditionally painted on watercolor paper, but these days you can also buy watercolor canvas, which is a special canvas made specifically for use with watercolors. You can even get creative and paint on antique book pages or other vintage ephemera, like old postcards. Watercolor paint generally has a translucent quality, which is great for ethereal or emotive effects. You can also layer imagery so that what is underneath shows through. On the other hand, it is difficult to cover mistakes, due to the translucency of the medium. For this reason, pre-planning is important. This is important to know when learning how to watercolor! Watercolor artists will normally sketch in their composition very lightly with a pencil before beginning to paint. 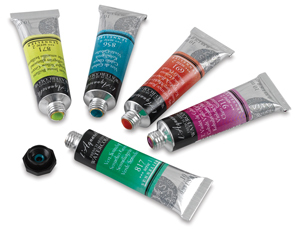 Another characteristic of watercolor paint is that is generally dries lighter than it appears when first applied. This may take some getting used to in the beginning. Watercolor paint generally dries quickly, unless you are working really wet. 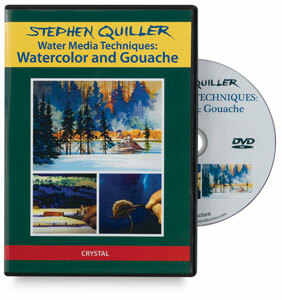 There are a variety of techniques that can be used to create watercolor paintings, such as painting wet-on-wet (very wet brush and wet paper), or wet-on-dry (wet brush on dry paper). You can also create different effects by splattering, using salt, or wax resists. These are just a few of the many watercolor painting techniques. Although the paint dries quickly on the paper, dried watercolor paint rewets easily. 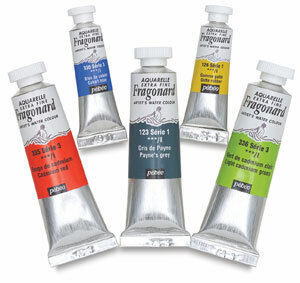 Dried watercolor paint is always susceptible to being "reactivated" as soon as it comes into contact with water. This can be used to great effect, such as laying over another layer of color or details, but it is also something to be careful about. On the other hand, it's okay if the paint dries out on the palette, as it will rewet once you add water. This means that it's very hard to "waste" watercolor paint, because all you need to do is cover the palette and save it for later. Once finished, watercolor paintings will need to be sealed with a protective spray. An archival spray will seal the colors and protect the surface of the painting. There are innovative, multi-step techniques for displaying watercolors without a frame, but traditionally watercolor paintings will need to be framed for display. This is basic information you'll need if you want to learn how to watercolor. The next step is to buy yourself a set of watercolors and go for it! 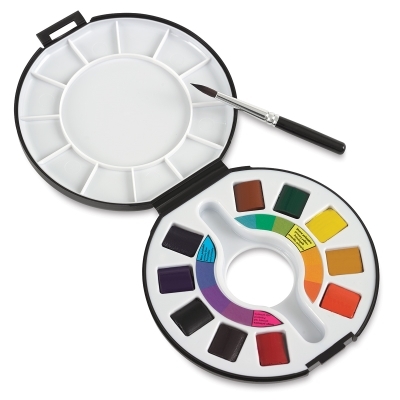 Learn all about watercolor painting supplies to find out exactly what you will need to get started with watercolor painting. Click here to return to the Watercolor Table of Contents.